Google is denying claims made in a report earlier this week that suggested Android Auto collects more data than it should. The report from Motor Trend says Porsche chose Apple's CarPlay instead of Android Auto for the infotainment system in its new vehicles due to concerns about Google's data collection. Specifically, the report says, "Porsche said certain pieces of data must be collected and transmitted back to Mountain View, California", sparking concerns that Google could spy on you with the information it collects through Android Auto. In response Google released a statement to a number of publications, including Motor Trend, denying that it's collecting the types of data suggested in the article. "We take privacy very seriously, and do not collect the data the Motor Trend article claims, such as throttle position, oil temp and coolant temp," Google said. "Users opt in to share information with Android Auto that improves their experience, so the system can be hands-free when in drive and provide more accurate navigation through the car's GPS." This is similar to the opt-in sharing features found on Android phones and tablets during initial set-up of the device, and which can also be switched on or off later. 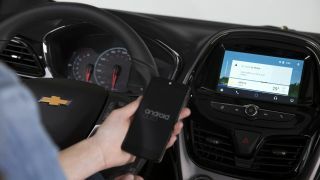 We'll be getting in touch with Porsche to clarify the statements it made to the publication in regards to Android Auto.